Tech-minded cyclists know how useful an iPhone with a good biking app can be for monitoring distance, health information, and location on a long ride. But try and access that info while peddling through traffic and that's a different story. 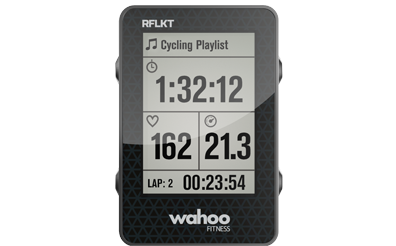 Enter the RFLKT, Wahoo Fitness' new iPhone-powered bike computer. The RFLKT attaches to your bike's handlebars and connects wirelessly to an iPhone 4s or iPhone 5 via Bluetooth, which means you'll have access to speed, cadence, heart rate, pace, and other data from cycling and fitness apps on your phone. Though the RFLKT only supports Wahoo's own fitness app at the moment, Wahoo says compatibility with other popular apps is on the way thanks to the device's open platform nature. The Bluetooth connection also means you can tap into a few of your iPhone's other features, most notably music playback. The RFLKT runs on a coin cell battery that lasts a year according to Wahoo, but it's not rechargeable so you'll need to buy a replacement battery when it runs out of juice. The RFLKT is available now for $129.99.